Last month the nation of Cyprus decided to seize money out of bank accounts. Then they changed their mind and didn't do it. This resulted in people getting scared in the USA. The gather thinking goes along the lines of "if it can happen in Cyprus then could it happen here?" And then people get upset and scared and worry that the politicians in Washington are going to decide to steal money out of their bank accounts to pay the national debt, or whatever other things they allege might happen. Then there was news that Cyprus would have to sell their gold reserves to pay their debts and the price of gold dropped as a result. Apparently people are worried that other nations now also might dump their gold reserves. I'm not sure why anyone would jump to that conclusion at all, but apparently thats the word and gold prices dropped. Never mind that Cyprus gold reserves are only about €400 million. Are you worried about Cyprus? Don't be. First of all let me as a couple questions: Do you know where Cyprus is on a map? I'd wager a lot of us don't. I suppose that doesn't matter really, we don't need to know anything about world geography to be paranoid about taxes or financial Armageddon. OK, so lets try this tactic. Do you know anything about the economy of Cyprus? Do you know how large Cyprus is? Do you know why Cyprus has economic problems? I would have to say that I don't know much at all about Cyprus. Chances are pretty good that the vast majority of Americans don't know much of anything about Cyprus. Lets run on over to Wikipeda and learn about Cyprus together shall we? I'm just going to skim that page... 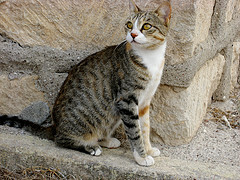 Interesting they were settled in the 2nd century BC by the Mycenean Greeks. Cyprus got its independence from U.K. in 1960. Its a relatively new nation. Turkey invaded Cyprus in 1974 after a coup d'état by Greek aligned Cypriots. Its the 3rd most populous island in the Mediterranean. AH HA! Its in the Mediterranean! Major religion is Greek Orthodoxy The population in 2011 was just over 1 million people and the GDP was about $24 billion. Now we can say we know something about Cyprus. Should we still panic? Public debt is about €15 Billion which is around 84% of GDP. Budget deficit of €1.1 B or 6% of GDP. They aren't doing all that well in any of those measures but theres worse nations out there. Several other countries have worse debt levels as measured by GDP. What we really need to look at is the 2012-2013 Cypriot Financial Crisis. "The 2012–2013 Cypriot financial crisis is a major economic crisis in the Republic of Cyprus that involves the exposure of Cypriot banks to the Greek Debt Crisis,..."
AH HA! Cyprus lent too much money to Greece! Theres the problem. I'm sure you know Greece has financial problems. Cyprus is close to Greece and has a lot of ties to Greece including financial ties. Cyprus banks had lent Greece money. Then Greece bond holders were forced to take a 50% cut and Cyprus banks couldn't stand that. 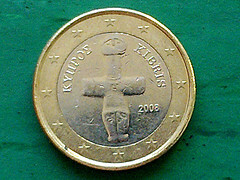 That paired with Cyprus' own struggling economy has put a lot of pressure on the Cyprus economy and government budget. Then because of all that Cyprus bonds were downgraded. Last month Moody's downgraded them to junk bond level. Then the government of Cyprus cracked a plan to raid peoples bank accounts. Oh, by the way it also notes that 50% of the money in Cyprus bank accounts is from Russians. In the end Cyprus got a €10 B bailout from the EU-IMF. Now we know whats going on in Cyprus. How much should you care? 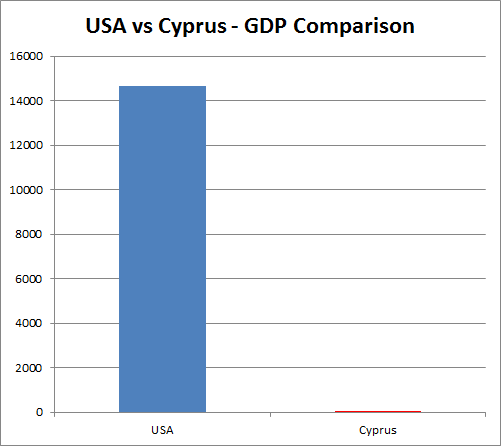 Can you see that little red sliver representing the $24B Cyprus GDP? Hard to really see it when placed next to the US economy since ours is 500 times as large. Well now thats better you can actually see that Cyprus is smaller than even small economies like Wyoming. 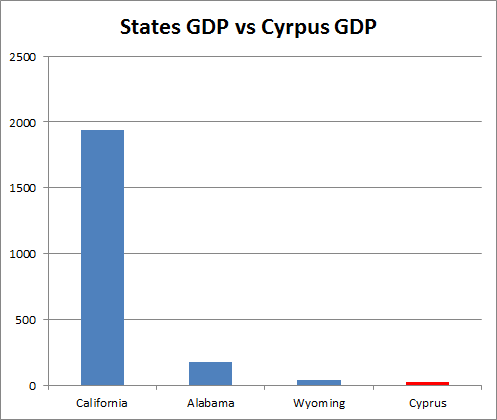 In fact Cyprus GDP is smaller than any single US state. How about GDP of individual US cities? We all know that Detroit is suffering. Are you worried about that? Detroits economy is 8 times as large as Cyprus. 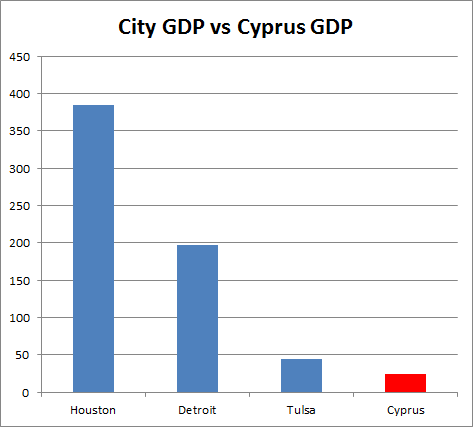 The economy of Tulsa is bigger than Cyprus. Speaking of cities, did you know the city of Stockton California is bankrupt? I'm going to assume that Stockton has a larger GDP than Cyprus. You may or may not know that Stockton declared bankruptcy. I don't recall the Stockton bankruptcy getting 1/10th the news coverage of the Cyprus bailout and the bank seizure that didn't actually happen. But then I don't know maybe I wasn't paying a whole lot of attention. In summary: Cyprus which is a small nation in the Mediterranean with an economy smaller than Tulsa, OK got a €10 B bailout from Europe and didn't seize money from their citizens bank accounts. No, you shouldn't worry about that.